BOISE, Idaho – Boise State’s quests for perfection and BCS glory were dashed again by a missed field goal. The fifth-ranked Broncos had a chance win a last-second thriller against TCU on Saturday, but freshman kicker Dan Goodale’s 39-yard kick sailed wide right as time expired to give Horned Frogs a 36-35 victory. 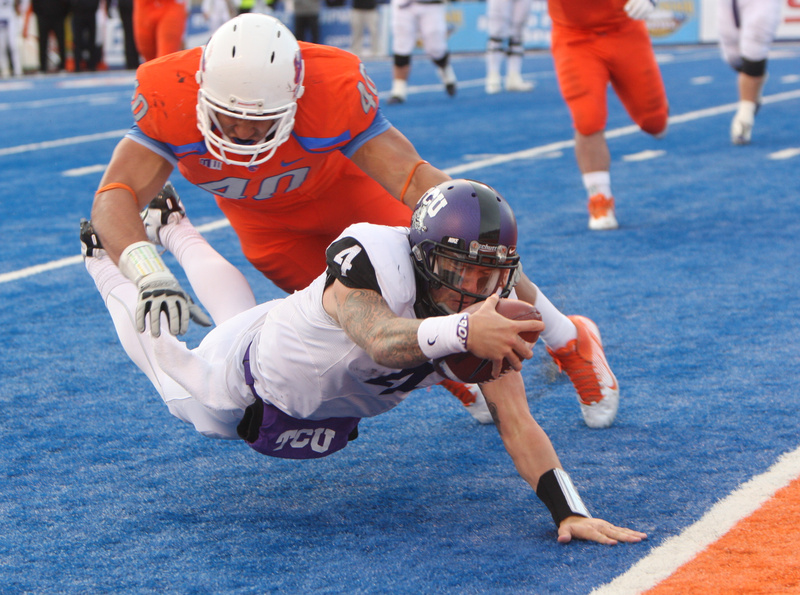 TCU now has a clear path to the Mountain West Conference crown. For the Broncos, losing this way may seem all too familiar. Last year, Boise State’s unbeaten season and BCS hopes were spoiled when senior Kyle Brotzman missed from short range in regulation and overtime, enabling Nevada to walk away with a 34-31 overtime win. Kellen Moore, who drove the Broncos into scoring range in the final 55 seconds, deflected any postgame parallels to the last season’s misery in Nevada, arguing instead that losses in big games rarely come down to one player or a single player. The Broncos (8-1, 3-1) clearly had their chances to avoid any field goal dramatics in a back-and-forth battle between two perennial BCS-busting teams. Leading 35-28, Boise State got the ball at its own 32 with 5:37 remaining. Moore then engineered a methodical drive and got the Broncos in scoring position when a fumble by backup running back Drew Wright was recovered by TCU (8-2, 5-0) with 2:26 remaining. Then Casey Pachall took over – bad news for Boise State. The sophomore was 24 of 37 for a career-best 473 yards and five touchdown passes, including scores of 75, 74 and 69 yards in the first half. Pachall calmly marched the Horned Frogs before firing a 25-yard TD pass to Brandon Carter, who leaped over a defender to make the grab in the end zone and pull TCU within 36-35 with 1:05 remaining. TCU coach Gary Patterson made a gutsy call, opting to put the game in Pachall’s hands and go for the lead instead of the tie. It worked. Pachall tossed a short pass to Josh Boyce, who fought his way into the end zone, putting TCU up 36-35 and quieting a raucous Bronco Stadium crowd. Patterson said the decision to go for two points was easy considering the circumstances. The Horned Frogs rolled up 506 total yards, carving up a Boise State secondary riddled with injuries and forced to use backups at the corners. The TCU victory also gives then 22 straight wins against conference foes and sets a new MWC record of 12 straight conference road wins. For the Broncos, the loss snaps their 35-game home winning streak, which had been the nation’s longest. No longer a contender for the big money, BCS bowls, Boise State now looks to bowls like the Poinsettia Bowl and Las Vegas Bowl.